Facing the Indian Ocean, on the South East Coast of Africa lies a gem for scuba diving: Mozambique. The country is a well-kept secret for divers who love megafauna. Whale sharks and manta rays are attracted by the upwelling phenomenon occurring in the Mozambique Channel. You can see them all year long. Starting August each year, humpback whales migrate with their young calves. With warm water temperatures, reefs hosting an incredible marine life too, plenty to do on land and welcoming inhabitants, Mozambique is a fantastic country to discover. Quirimbas Archipelago, in the far north of Mozambique, is home to a recently declared Marine Protected Area, the largest in Africa. It includes 27 secluded islands and sand bars stretching for 200km (125 miles). They are fringed with coral reefs and mangrove forests. While Pemba is the gateway to the archipelago, it is still very underdeveloped and beach lodges in the archipelago are rare and simple. Underwater, you’ll discover several marine turtles species, some napoleon wrasse, bump-head parrotfish, morays, nudibranchs and more. Bazaruto Archipelago is a chain of four large islands: Bazaruto, Benguerra, Santa Isabel and Santa Carolina. Bazaruto is more easily accessible than the Quirimbas archipelago, with vilanculos as its gateway. The two smaller islands are uninhabited, while the others, Bazaruto and Benguerra, have a few small villages scattered amongst wild orange and cashew nut trees. These are places to relax, to escape and to explore. A marine park covers most of the archipelago, protecting the amazing marine life of these turquoise waters. In Southern Mozambique, Tofo is a small village with a laid back atmosphere and a very large sand beach. The accommodation is designed for backpackers however there are also more and more small boutique hotels for off the beaten path travelers who want more comfort. Plankton upwelling phenomenon makes it a preferred spot for manta rays and whale sharks, attracting more and more divers. The best way to discover the underwater life is to go with a dive shop based in Tofo, Mozambique. In August and September, you may also spot humpback whales. These are busy months with many South African coming over so it is a good idea to book your dives and accomodation in Tofo in advance. In Tofo, you can also spend a few days with the world-famous Marine Megafauna Foundation, whose main mission is protecting whale sharks and mantas involving the local community. It is a good way to learn more about marine species, understand the day to day of marine biologists and support conservation of whale sharks and manta rays. All the way south, at the frontier with South Africa is another backpacker’s and divers favorite, the village of Ponta do Ouro. With its small cafes, market, sand paths and huge bay, Ponta do Ouro is a place you will want to stay for at least a week. As in Tofo, the diving is spectacular, and it is also an excellent spot for surfers. The sites offer a good mix of macro life and also big pelagic, with bull sharks often sighted on Pinnacle dive site. The Best way to dive in Ponta do Ouro is to go with a dive shop that will bring you to the best dive sites where you’ll see sharks without using any chum. In August and September, humpback whales are also spotted there with their calves. After diving, head to the bakery of the village and buy a few of these delicious Portuguese pie, the ‘pasteis de nata’… life is good! Quirimbas Archipelago: June to September. Water temperature is between 25 to 26 degrees Celsius (77 to 79 degrees Fahrenheit). Bazaruto Archipelago: June to September. Water temperature is between 23 to 24 degrees Celsius (73 to 75 degrees Fahrenheit). Matemo Island: explore the wreck of a hundred years old coal steamer ship. There is usually good visibility at this site and you’ll get to see Napoleon wrasse, turtles and sometimes even dolphins. Medjumbe Island: the small island offer fantastic wall dives, such as Cliffs of Insanity, Sambi Sambi or Lauras Leap, all with healthy corals. Mostly deep dives they are suited for advanced divers. You might also witness some humpback whales passing by in season. Vamizi Island: Neptune’s Arm is a site with a fantastic topography: canyons, pinnacles and some drop-offs with abundant marine life makes it one of the best dive sites in Africa. Ibo Island: expect some gentle slopes and beautiful coral gardens full of life. With shallow reefs, Ibo island dive sites are perfect for open water divers. Two-mile Reef: the most famous reef of the area. It is located off Bazaruto island and offers a multitude of sites ranging from 6 to 21 meters depth (65 feet). The most famous one is The Aquarium. Canyon Deep and Marlin Pinnacles: off vilanculos, both dive sites are best for advanced divers with experience in currents. Expect to pass over canyons and pinnacles that go down to about 30 meters (about 100 feet). Beautiful topography and plenty of marine life makes it one’s favorite of the area. San Sebastian: various sites such as Amphitheater and Caves offer some walls with plenty to explore and also some overhangs and caves. A dive that starts shallow and that you can explore to about 30 meters (98 feet) depth. 12-Mile Reef: a favorite of advanced divers, the dive site starts at 27 meters (88 feet), with large caves and overhangs. You can drift on the site and even go down to 44 meters (144 feet) with more advanced certifications. Expect to encounter some sharks, and lots of fish. Amazon: featuring a manta cleaning station, the site is full of colors, life and most often currents. Maximum depth is 32 meters (105 feet)and it’s not rare to see white tip sharks by the cave, leopard and nurse sharks! The site is 21 km (13 miles) North of Tofo, in front of Barra lighthouse. Amphitheater: a dive site with a fantastic topography: pinnacles, caves and overhangs. Its famous for its macro life and you may even see a whale shark passing by! Perfect for open water divers as it is protected and shallow (max depth 18 meters or 59 feet). Giant’s Castle: located just outside Tofo, expect to see, guess what…? some more giants! Everything seems to be passing by this site: manta rays, whale sharks, but also the small-eye stingrays - the largest ones in the world, and in season, humpback whales. What a dive!! Marbel Arch: located in what is called “Whale Shark Alley, this site offers a beautiful swim through that will take you inside the reef. There are plenty of caves, overhangs, and a diverse marine life with snappers, sting-rays, lobsters, trevallies, snappers and more. Manta Reef: the iconic dive site of Tofo, where you’ll have most chances to encounter the mesmerizing mantas rays. With a max depth of 28 meters (92 feet) and pinnacles rising to 15 meters (49 feet), the reef offers plenty of opportunities to spot some big and small. Pinnacles Reef: the best dive site to see sharks in the summer - of the southern hempisphere, it is a favorite of experienced divers. With pinnacles rising from 50 to 29 meters (164 to 95 feet), up to 19 species of sharks have been spotted there. You will frequently see bullsharks, but also eagle rays and lots of other fish. Aquarium: another deep dive at about 24 meters (78 feet), where you’ll be rewarded with a rich marine life and discover an interesting topography with a small but amazingly beautiful reef. Atlantis: another dive site for experienced divers with a long reef at depth: between 38 and 47 meters (125 to 154 feet) and often some currents. Nice topography with drop-offs and big square boulders. Bass City: between 16 and 22 meters (49 to 72 feet), a reef that is home to giant potato bass. Plenty of juvenile fish, pelagic fish, and also some blue spotted rays, marble electric rays, and leopard sharks are often spotted there. Three Sisters: from the name of three pinnacles lying at 26 meters depth (85 feet) 50 meters (165 feet) apart from each other. Another small and beautiful reef with lots of fish, ghost-pipe fish, razorfish, and also bigger game fish. We always recommend to have your own dive gear, well maintained, you’ll be safer and more comfortable. Light and compact dive gear is particularly suited for travels. For safety reasons, always bring with you a surface marker buoy, and know how to use it. We also recommend you to have a Nautilus Lifeline, a GPS that could save your life if taken by currents. They can be strong some sites of Mozambique. You’ll probably get to spend a day or two in Maputo, in between flights. Here are some suggestions of what to see in one (busy) day or two more relaxed days. Founded in the late 18th century, the city’s growth was slow until the railway was constructed at the end of the 19th century, linking the city to Pretoria. Pay a visit to the railway station that has a beautiful architecture, you won’t be surprised to discover that it was designed by an associate of Eiffel. A few minutes from there is the municipal market, with lots of fruits, fish and spices. Continue to Jardim Tunduru, a botanical garden that often see married couples coming to take pictures with their families, with lots of beautiful singing! Next to it is the Centro Cultural Franco-Moçambicano, another beautiful building with lots of arts and even a little cafe. Go on with your walking tour to see the City Hall, Independence Square and the Cathedral. Take a taxi to have lunch in the Fish market a bit outside town. In the afternoon, go to the Arts and Craft market in a garden on Avenida dos Martires de Machava. End your day with a drink at Cafe Acacia with a view on the waterfront. 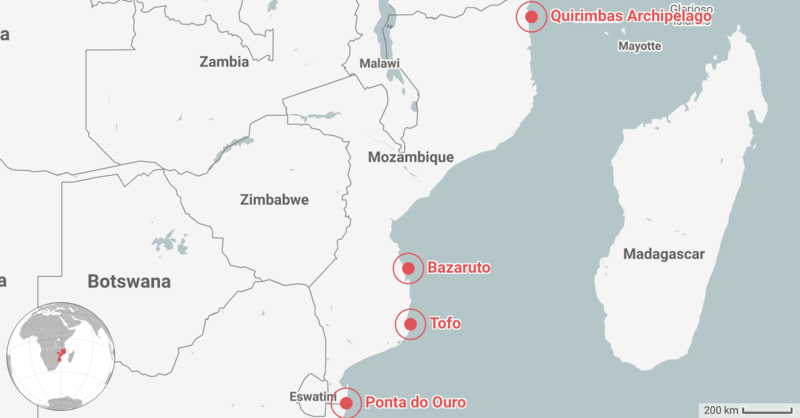 Chances are you’re a big fan of whale sharks and mantas if you’re traveling to Mozambique. Tofo is where Marine Megafauna Foundation established it first base. Plan ahead to spend three days and meet Marine Megafauna Scientists, go on an ocean safari to spot whale sharks, humpbacks or mantas and see how they engage the local community, adults and kids, to protect the Ocean. Tofo beach and more specifically Tofinho, a short walk from Tofo main beach, is a good spot for kite-surfing. Plan to go in August, September, October, November or December as this is when you’ll have the strongest winds. Small, medium and big waves, tide-independent and a warm weather - you’ll only need shorts or at most, a shorty, makes it very enjoyable! Ponta do Ouro is mostly known by South Africans who come here to surf. A super long stretch with plenty of waves to learn on, a small number of surfers, and dolphins will come play along! You can easily rent surf boards and get a private lesson. After a good session, relax with a view and a delicious meal and smoothie at Mango roof-top cafe. The civil war affected Mozambique’s Gorongosa National Park and Niassa Reserve game populations. In the 1970s and 80s, species were extensively poached. Restorations projects in recent years try to repopulate the parks, however the recovering is slow. To see the “Big Five”, head towards Kruger National Park in South Africa, only a few hours of driving from Maputo. You can go there in a (long) day trip but it is best to spend a few days and sleep in the park. It is faster and cheaper to reach the city of Pemba from Tanzania. Air Mozambique has flights between Dar es Salaam in Tanzania and Pemba. From there, take a boat or fly to the islands. As it is very remote with little accommodation, it might be good to plan a but in advance where you’ll go. Take a flight to vilanculos from either Maputo in Mozambique or Johannesburg in South Africa. From there, take another flight or a boat to the archipelago. Most places to stay are high-end so plan ahead. Take an international flight to Maputo, the capital of Mozambique, with for instance TAP Portugal, South African Airways, or Turkish Airlines. Fro there, you can either take a shared shuttle, (6 to 8 hours) or a flight from the local Mozambican airline, LAM (about one and a half hour) until Inhambane. The largest international airlines flying to Maputo in Mozambique are TAP Air Portugal, South African Airways, and Turkish Airlines. From Maputo, the capital of Mozambique, grab the local ferry (10 minutes) to the other side of the river and then take a transfer by minivan for about 3 hours.